(LonelyPlanet.com) -- With more than 2,000 islands, ranging from tiny atolls to the veritable continent that is Crete, maritime Greece is unmatched for sheer variety. Beaches, history, walking, cycling, water sports, festivals, food ecology: chances are if you want it, they've got it. 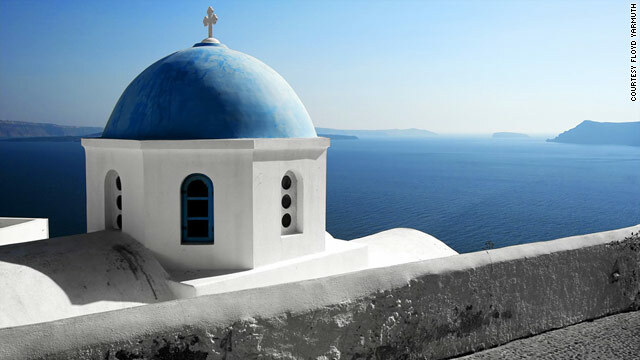 Here are just a few of the incomparable offerings Greece's islands hold. Almost every Greek isle has great beaches, but few come with a Venetian castle, like laid-back Frangokastello Beach in southern Crete. For lapping turquoise waters, try Platys Gialos and Kambos on quiet Lipsi, and the stunning cove at Myrtos Beach in Kefallonia. To see and be seen, bowl up to one of Skiathos' 65 beaches, join the mainstream masses at 1200m-long Koukounaries Beach or bronze up on nudist-friendly Banana and Little Banana Beach, popular with the gay and lesbian set. Even more full-on are the legendary Paradise and Super Paradise beaches on decadent Mykonos. Gape at Rhodes' magnificent, walled old town, where the Knights of St John ruled from 1309-1523, and explore their quarter before visiting the 14th-century Palace of the Grand Masters. Tiny Delos, near Mykonos, was once dedicated to Apollo; see ruins of shrines to the gods and explore mosaic-rich ancient dwellings. Kick back in Corfu's old town, with its Venetian, French and British architecture. On ethereal Patmos, visit the Monastery of St John the Theologian, and see the grotto where the saint wrote the Book of Revelations. The varied terrain on Greece's biggest island, Crete, ranges from gentle plateaus dotted with windmills to canyons and mountains. Hiking the Samaria Gorge, Europe's longest at 16km, brings you through the homeland of Crete's famed wild goat, the kri kri. The Zakros-Kato Zakros (a former Minoan palace site) amble in eastern Crete is more relaxed. Cool relief awaits on the forested 'river walk' at southern Plakias (inquire at the excellent Youth Hostel Plakias). The Greek Mountaineering Club of Hania informs about trekking opportunities and conditions, while Hania'sAlpine Travel organizes walking and trekking tours. Fertile Naxos boasts numerous walks along the old paths connecting the villages of the central plain; these traverse ancient temples, Hellenistic towers and Byzantine churches. For guided walks contact Flisvos Sport Club. The Sporadic isles of Alonnisos and Skopelos, full of forests, orchards and wildflowers, offer more excellent walks; contact the Alonnisos Walking Club and Skopelos Walks. The meandering country roads of Evia make for blissfully stress-free cycling. Another favorite is well-equipped Kos, bursting with bike-rental places. Excellent forested trails (and a popular international race) bring mountain biking aficionados to Thasos. For organized dives in sea caves full of colorful aquatic life, check out Karpathos Diving School on Karpathos. Milos has phenomenal diving; Diving Center Milos brings you face-to-face with deep-sea fish, dolphins and even monk seals. Snorkeling is also great here, and on Paros and remote Kastellorizo. Lonely Planet: What's the world's sexiest accent? Volunteer to protect endangered wildlife like sea turtles on Zakynthos with the Earth, Sea & Sky Center and Sea Turtle Protection Society. Get your hands dirty while tending endemic mastic trees, and explore Chios' other eco-tourism opportunities with Masticulture in Mesta. Finally, enjoy guilt-free eating and sleeping in Crete's secluded mountains at Milia Traditional Settlement, powered by solar energy and living off its organic farm and good vibrations. Lesvos is renowned for its olive oil and its ouzos (it produces some 70 percent of all Greek ouzos). The national aperitif is served with mixed mezedhes (appetizers) at traditional ouzeries (ouzo restaurants), which blend the island's old Turkish influences with Greek seafood specialties. Lesvos produces fine wine, as does Samos, famed for its sweet muscat dessert wine. Like other Ionian islands, Corfu was never Ottomanised, and its cuisine remains Italian-flavored. Folegandros' Cycladic specialties include matsata (pasta with rabbit/chicken in red sauce), astakomakaronada (lobster with spaghetti) and liokafto (sun-dried fish). Crete is famous for its olive oil and specialties like dakos (rusks topped with tomato, olive oil and cheese) and myzithra (sweet cheese, used in kalitsounia pastries). Horta (wild greens) provide seasoning for fish or roast lamb. © 2011 Lonely Planet. All rights reserved.